In accordance with its "print to buy" program, today the Fed bought another $7 billion of Treasuries. The Federal Reserve bought $7 billion of Treasuries maturing between May 2012 and August 2013 on Thursday, the New York Fed said on its Website. 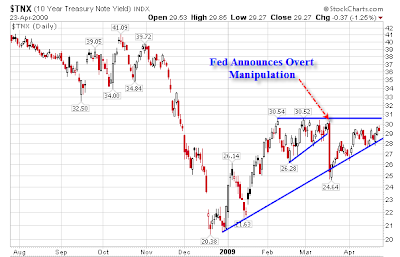 Inquiring minds are looking at a chart to see what the market thinks of this manipulation. "Today the Federal Reserve printed $7 billion dollars and used it to buy an equivalent amount of 7 and 10 year Treasury bonds. As I publicly asked before, if Mr. Fed can't rig the price of an asset by buying it with printed money, why should anyone else buy it?" Those wishing to keep an eye on these price rigging attempts can follow the Federal Reserve Bank Permanent OMOs: Treasury link. It is ridiculous for the Fed to think it can control the vast $trillion treasury market with pea shooting efforts at $7 billion a pea. However, as the charts above show, the Fed announcement hugely distorted the market in smaller timeframes. As Prof. Zucchi says "If Mr. Fed can't rig the price of an asset by buying it with printed money, why else should anyone else buy it?" Other than the initial pop, the Fed's silly attempt to game the system may have caused so much mistrust that it is putting upward pressure on yields. What we do know for sure is that Bernanke's efforts to prevent deflation have failed spectacularly as documented in Bernanke's Deflation Preventing Scorecard. 1. The idea of a sustainable economic recovery starting in the second half is a farce. A collapsing recovery effort will renew a flight to safety in treasuries. 2. The Fed is printing massive amounts of dollars to bailout the banks in an effort that is also doomed to fail. The Fed's printing is putting upward pressure on yields. 3. Seasonality on treasuries is negative from January through May. Seasonality turns positive in June. How much more selloff is left? 4. The Fed's blatant attempt to force yields lower is arguably counterproductive. Regardless of what happens, this seems to be a poor place to initiate shorts. 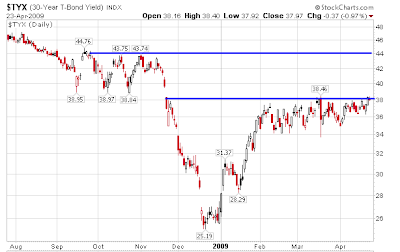 The time to short treasuries was December or the subsequent retest of the yield low in January. There is little reason to enter a trade in the Twilight Zone with all these competing factors.